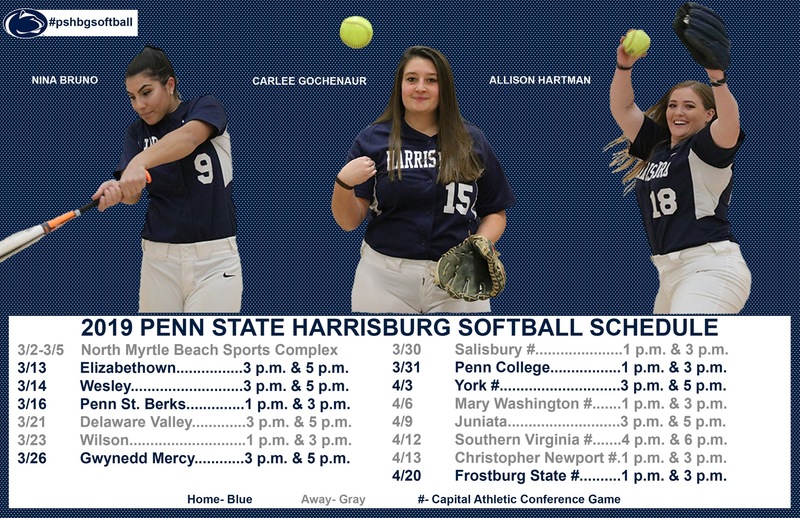 The Penn State Harrisburg softball team battled Lancaster Bible in nonconference action on Wednesday March 20, taking control of game one in the first inning. Katie Humphrey drove a single to center field to start the inning. Sarah Coolbaugh then laid down a perfectly placed bunt to reach base. After Nina Bruno moved the runners into scoring position, Allison Hartman blasted a single into right field, driving in two runs and giving Harrisburg a 2-0 lead. Hartman, the starting pitcher, and the rest Lions defense would take advantage of the lead and stifle the Chargers offensive attack. Lancaster Bible only managed three hits during the game, while Hartman struck out eight Chargers batters along the way. Maddie Krantz eliminated one of those base runners, throwing out her second runner of the season. The Lions offense would get baserunners in every inning but would not strike until the fifth inning. Bruno would lead off the inning by doubling down the left field line. After she tagged up and advanced to third base, Delaney Nevius flew out to deep right field allowing Bruno to tag up and score. Harrisburg would cruise the rest of the way, capturing the 3-0 victory. Using momentum from their game one victory, the Lions came out strong taking the lead in the first inning of game two. After Katie Humphrey reached on an error by the Chargers shortstop, Sarah Coolbaugh singled to left field and due to an errant throw by the Chargers left field, Humphrey would score and Coolbaugh would advance to third. Bruno would follow with a ground out that allowed Coolbaugh to score, putting Harrisburg ahead 2-0. The Chargers would put their first run of the day on the board in the second inning, but the Blue & White would answer right back. With two outs in the inning, Humphrey would single and Coolbaugh would reach on an error, putting runners in scoring position for Bruno. Bruno smacked a double into the left center gap, allowing both runners to score. Allison Hartman would then reach on an error by the Chargers right fielder, allowing Bruno to score. Kaylee Simon would get the Lions on the board in the third inning. With Carlee Gochenaur and Maddie Krantz on base, Simon crushed her first career triple into right field, scoring both runners and putting Harrisburg ahead 7-1. Lancaster Bible would take advantage of three Lion errors in the fourth inning, scoring four runs and forcing Lions starter Mary-Kate Penczkowski from the game. Penczkowski, who earned her first career win, struck out three Chargers in her four innings of action. Harrisburg recaptured the momentum in the bottom for the fifth inning. Singles from Kaylee DeMatteo and Gochenaur put runner in scoring position for Simon. Simon singled up the middle, driving in DeMatteo. Humphrey followed with a sacrifice fly bringing in Gochenaur. Later in the inning, Simon would score on a wild pitch putting the Blue & White ahead 10-5. Simon, who came on in relief of Penczkowski, quelled the Chargers momentum, allowing no runs on four hits in the final three innings of action. She added a pair of strike outs and earned her first career save. The Lions will return to the diamond on Thursday March 21, when they travel to Delaware Valley at 3:00 p.m. and 5:00 p.m.